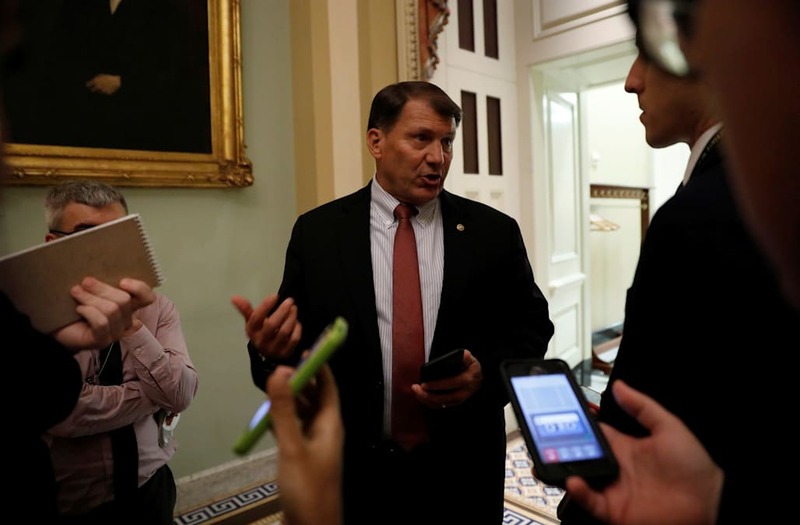 GOP Sen. Mike Rounds of South Dakota said he plans to vote against the short-term government funding bill put forward by Republicans, increasing the risk of a government shutdown over the weekend. Congress has until the end of Friday to pass a funding bill or the federal government will enter a partial shutdown, including the possible furlough of hundreds of thousands of federal workers. The current GOP plan is to pass a bill, introduced in the House on Tuesday, to extend the deadline to February 16 while keeping the current funding levels. The legislation is known as a continuing resolution (CR). Rounds told CNN's "New Day" that the government needs to stop running on CRs, which leave many federal agencies in limbo in terms of funding. The government has been operating under a series of short-term CRs since September when the new fiscal year began (this would be the fourth CR of the year). In an interview with Sen. Angus King, an independent who typically caucuses with Democrats, Rounds agreed after King said there should be no CR that would "kick it down the road for another month." Rounds is the second Republican in as many days to come out against the current GOP funding plan, after Sen. Lindsey Graham. Both of them raised concerns over the uncertain funding flows for the military that comes as part of a CR. Every Republican senator and at least 10 Democratic members would need to vote for the CR in order to avoid a filibuster. With Rounds and Graham's defections, the path to avoid a shutdown becomes even more perilous. Rounds also expressed a fatigue with the CR strategy that the Republican leadership continues to employ. Both King and Rounds said that if the leadership from both parties came to lawmakers and told them they had a deal for long-term funding that included fixes for other legislative items like the Deferred Action for Childhood Arrivals (DACA) program but needed a few days, an even shorter extension would be fine. "If they came to us and said, 'Okay, we've got a deal, here are the terms, we need five days in order to do the paperwork,' I think both of us would go along with that," King said, and Rounds agreed. As it stands, the two parties are still not close to a deal on the DACA program and immigration in general. President Donald Trump foiled a bipartisan push in the Senate that would have included a codification of DACA and increased border security. Martha Morales and Juan Manuel Gonzalez Camacho hug their grandaughter Aileen Gonalez and son Adrian Gonalez Morales as they are allowed to meet after a door is opened along the United States-Mexico Border wall during Opening the Door Of Hope/Abriendo La Puerta De La Esparana at Friendship Park in San Ysidro, California on Saturday, November 19, 2016. U.S. Border patrol agents stand at an open gate on the fence along the Mexico border to allow Adrian Gonzalez-Morales and his daughter Aileen hug his parents Juan and Martha, as part of Universal Children's Day at the Border Field State Park, California, U.S., November 19, 2016. U.S. Border patrol agents stand at an open gate on the fence along the Mexico border to allow Luis Eduardo Hernandez-Bautista hug Ty'Jahnae Williams and his father Eduardo Hernandez (not in view), as part of Universal Children's Day at the Border Field State Park, California, U.S., November 19, 2016. Family members hug during a U.S. Border Patrol sponsored visit at the U.S.-Mexico border fence in Tijuana, Mexico, on Saturday, Nov. 19, 2016. The U.S. Border Patrol, in coordination with immigrant rights groups, opened the metal gate so that previously selected families could visit for several minutes. A woman in Friendship Park in San Diego, California, U.S. speaks with children across a fence separating Mexico and the United States, November 12, 2016. Picture taken from Tijuana, Mexico. U.S. Border patrol agents stand at an open gate on the fence along the Mexico border to allow Edith Hernandez and her daughter Yvette hug Maria Plata-Colin, as part of Universal Children's Day at Border Field State Park, California, U.S., November 19, 2016. People in Friendship Park in San Diego, California, U.S. are seen behind a fence separating Mexico and the United States, November 12, 2016. Picture taken from Tijuana, Mexico. Relatives separated by immigration hug at an open gate on the fence along the Mexico and U.S border on Universal Children's Day in Tijuana, Mexico November 19, 2016. Luis Hernandez hugs his Father Eduardo as they are allowed to meet after a door is opened along the United States - Mexico Border wall during Opening the Door Of Hope / Abriendo La Puerta De La Esparana at Friendship Park in San Ysidro, California on Saturday, November 19, 2016. Members of the Gonzalez family hug each other and react as they encounter at the gate of the U.S.- Mexico border fence opened for a few minutes on November 19, 2016 in Playas de Tijuana, Mexico. The door opening was organized by pro-migrants NGOs and local authorities in coordination with the United States Border Patrol. A U.S. Border patrol agent stands at an open gate on the fence along the Mexico border to allow Laura Avila and her daughter Laura Vera Martinez hug Maria Socorro Martinez Lopez, as part of Universal Children's Day at the Border Field State Park, California, U.S., November 19, 2016. A young boy joins his family members as they hug during a U.S. Border Patrol sponsored visit at the U.S.-Mexico border fence in Tijuana, Mexico, on Saturday, Nov. 19, 2016. The U.S. Border Patrol, in coordination with immigrant rights groups, opened the metal gate so that previously selected families could visit for several minutes. Rounds expressed frustration with the president for Trump's seemingly fluid position on immigration. "I think it depends on when you spoke to him last and who was advising him last," Rounds said when asked if anyone knew what the president wanted in a deal.